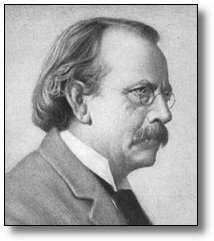 Sir Joseph John Thomson, OM, FRS (18 December 1856 - 30 August 1940) often known as J. J. Thomson, was an English physicist, the discoverer of the electron. Joseph John Thomson was born in 1856 near Manchester in England, of Scottish parentage. He studied engineering at Owens College, Manchester, and moved on to Trinity College, Cambridge. In 1884 he became Cavendish Professor of Physics. In 1890 he married Rose Paget, and he had two children with her. One of his students was Ernest Rutherford, who would later succeed him in the post. Influenced by the work of James Clerk Maxwell as well as the discovery of the X-ray, he deduced that cathode rays (produced by Crookes tube) exhibited a single charge-to-mass ratio e/m and must be composed of a single type of negatively charged particle. He called these particles "corpuscles." The term electron had been proposed earlier, by G. Johnstone Stoney, as a fixed quantum of electric charge in electrochemistry, but Thomson realized that it was also a subatomic particle, the first one to be discovered. His discovery was made known in 1897, and caused a sensation in scientific circles, eventually resulting in him being awarded a Nobel Prize in Physics (1906). His son George Paget Thomson later received the prize for proving that the electron also had properties of a wave (See wave-particle duality). Much of this work was done at the Cavendish Laboratory. Thomson's investigations into the action of electrostatic and magnetic fields on the nature of so called "anode rays" or "canal rays" with an instrument he called a parabola spectrograph ) are considered as the invention of the mass spectrometer, a tool which was later improved by Francis Aston and allows the determination of the mass-to-charge ratio of ions and which has since become an ubiquitous research tool in Chemistry. Prior to the outbreak of World War I, he made another ground-breaking discovery: the isotope. In addition, Thomson proposed the Plum pudding model of the atom in 1904, though it was disproven in 1909. He was knighted in 1908 and appointed to the Order of Merit in 1912. In 1914 he gave the Romanes Lecture in Oxford on "The atomic theory". In 1918 he became Master of Trinity College, Cambridge, where he remained until his death. He died in 1940 and was buried in Westminster Abbey, close to Sir Isaac Newton.